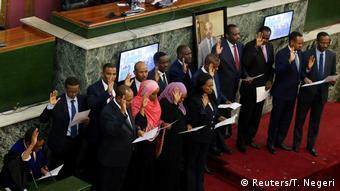 Ethiopia's parliament has voted to appoint a woman to the largely ceremonial position of president. But the country continues to be riven by ethnic conflict even as it's praised for its government reforms. In a unanimous vote, Ethiopian lawmakers elected Sahle-Work Zewde, a seasoned diplomat with years of experience working at the United Nations, to replace the previous president, Mulatu Teshome. Sahle-Work was formerly Ethiopia's ambassador to Senegal, Djibouti and France, as well as to the Intergovernmental Authority on Development, a regional bloc. She resigned as the UN's top representative to the African Union to take on the position of president. The role of Ethiopian president is largely ceremonial – it's the prime minister who wields power. The appointment of Sahle-Work, however, has deep symbolic value, tweeted the Ethiopian prime minister's chief of staff, Fitsum Arega. "In a patriarchal society such as ours, the appointment of a female head of state not only sets the standard for the future but also normalises women as decision-makers in public life," he wrote. In the capital, Addis Ababa, people were exuberant about Sahle-Work's appointment. "I cannot tell you how happy I am. Not so much because we have a lady as president but because she is who is. So I am really very, very proud," one woman told DW. "I am very excited," another woman said. "Big changes are coming our way. We are expecting a lot of things now from our new president." "I think women deserve even the highest function in the country," one man commented. He added that in giving so many government posts to women, Ethiopia was taking a "very big step" – a reference to the government's decision last week to appoint women to half of the posts in its 20-seat Cabinet, making it one of the few in the world with gender parity. Women also secured the key roles in defense and the newly created Ministry of Peace, which is responsible for police and domestic intelligence agencies. These moves are the latest in sweeping political and economic reforms implemented by Prime Minister Abiy Ahmed. The 42-year-old took over from Hailemariam Desalegn, who resigned following more than two years of deadly anti-government protests primarily by the Oromo and the Amhara people. Both groups charged they had been marginalized by Ethiopia's ruling party, the EPRDF, which has been in power since the overthrow of the military government in 1991. While the anti-government unrest dissipated after Abiy became prime minister, ethnic fighting flared almost immediately. The rise in violence contrasts sharply with the global praise for Abiy, who has forged peace with neighboring Eritrea, released political prisoners and invited exiled dissidents and media outlets to return home. 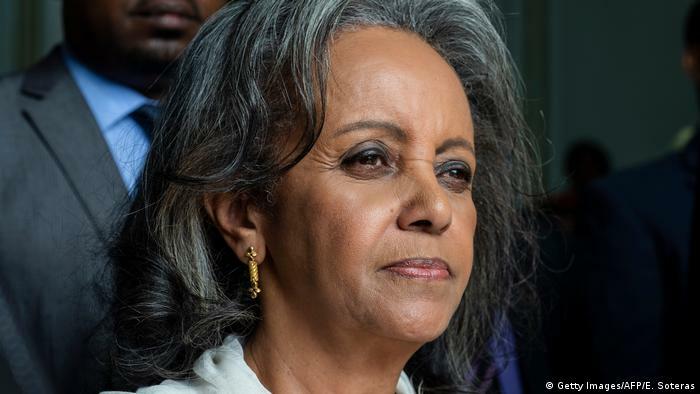 After her approval, Sahle-Work told parliament that as president, she will focus on bringing together all sides to achieve peace. "When there is no peace in [a] country, mothers will be frustrated. Therefore, we need to work on peace for the sake of our mothers," she said on Thursday. Ethiopia has more than 80 ethnic groups, and ethnic tension is unfolding on several different fronts. Nearly 1 million people have fled their homes in southern Ethiopia since long-simmering clashes between the Oromo and Gedeo ethnic groups erupted there between April and June, according to UN agencies. 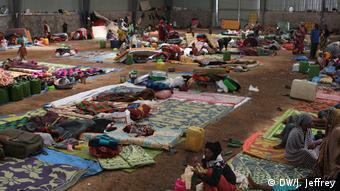 Fighting in September between the Oromo and other ethnic groups in and around the capital killed up to 65 people. The violence has simmered for decades. Awol Allo, an Ethiopian commentator who teaches law in Britain, believes the recent clashes are the "the boiling-over of frustrations" resulting from the EPRDF's absolute rule. This is echoed by Yohannes Gedamu, a political scientist at Georgia Gwinnet College. Although Abiy has been lauded for his reforms, the country's power structure remains unchanged, he warned recently in an article for the online publication The Conversation. "The ruling [EPRDF] remains the most powerful political force in the country. If Ahmed wants to transform Ethiopia, he must also take strides to create democratic change within the coalition. The front must embrace internal, ideological reforms for peace and security to be achieved in Ethiopia at large," he wrote. Harry Verhoeven, an Africa expert at Georgetown University Qatar, thinks that after protesters succeeded in toppling the government of Hailemariam Desalegn, they had learned that "violence pays." "One can't underestimate the power of example here," he says.